When used alone, both vanadate and hydrogen peroxide (H2O2) are weakly insulin-mimetic, while in combination they are strongly synergistic due to the formation of aqueous peroxovanadium species pV(aq). Administration of these pV(aq) species leads to activation of the insulin receptor tyrosine kinase (IRK), autophosphorylation at tyrosine residues and inhibition of phosphotyrosine phosphatases (PTPs). We therefore undertook to synthesize a series of peroxovanadium (pV) compounds containing one or two peroxo anions, an oxo anion and an ancillary ligand in the inner co-ordination sphere of vanadium, whose properties and insulin-mimetic potencies could be assessed. These pV compounds were shown to be the most potent inhibitors of PTPs yet described. Their PTP inhibitory potency correlated with their capacity to stimulate IRK activity. Some pV compounds showed much greater potency as inhibitors of insulin receptor (IR) dephosphorylation than epidermal growth factor receptor (EGFR) dephosphorylation, implying relative specificity as PTP inhibitors. 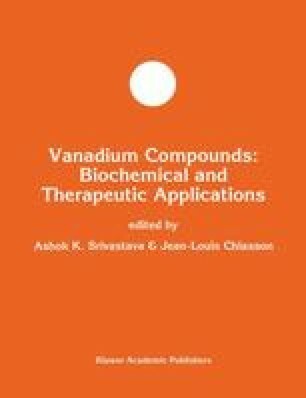 Replacement of vanadium with either molybdenum or tungsten resulted in equally potent inhibition of IR dephosphorylation. However IRK activation was reduced by greater than 80% suggesting that these compounds did not access intracellular PTPs. The insulin-like activity of these pV compounds were demonstrable in vivo. Intra venous (i.v.) administration of bpV(pic) and bpV(phen) resulted in the lowering of plasma glucose concentrations in normal rats in a dose dependent manner. The greater potency of bpV(pic) compared to bpV(phen) was explicable, in part, by the capacity of the former but not the latter to act on skeletal muscle as well as liver. Finally administration of bpV(phen) and insulin led to a synergism, where tyrosine phosphorylation of the IR β-subunit increased by 20-fold and led to the appearance of four insulin-dependent in vivo substrates. The insulin-mimetic properties of the pV compounds raises the possibility for their use as insulin replacements in the management of diabetes mellitus.